WASHINGTON, Jan 21 (Reuters) - U.S. President Barack Obama may order a hold on a proposal issued in the final days of the Bush administration to expand offshore drilling in previously banned areas, an Interior Department official told Reuters on Wednesday. Shortly after being sworn in on Tuesday, Obama ordered all federal agencies and departments to halt pending regulations until they can be reviewed by incoming staff. An Interior official said the department is waiting for clarification from the White House on whether a proposed draft of a five-year plan to lease areas in the Atlantic and Pacific waters for oil and natural gas drilling can go forward. The preliminary plan would authorize 31 energy exploration lease sales between 2010 and 2015 for tracts along the east coast and off the coasts of Alaska and California. Both presidential and congressional bans on drilling in most U.S. waters ended last year. Separately, the Interior official said the department's plan to develop oil shale fields in the western United States may also be stopped by Obama's order. (Reporting by Ayesha Rascoe and Tom Doggett) "
.......please don't screw up our country with your nanny-state mentality. Freedom and opportunity are the keys to our prosperity. 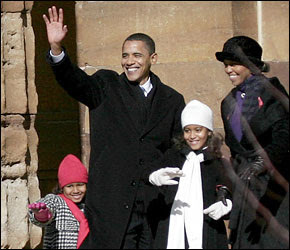 This is my favorite Obama family picture. They ar a beautiful family! God bless them and The United States of America! Andy Reid is the Philadelphia Eagle's version of Danny Ozark. Ozark was a nice man who managed the Phillies back in the 1970's and could never get them to the World Series. The team finally fired Ozark. His replacement and the team won the 1980 World Series with almost the same players except they added Pete Rose (not an inconsequential addition I must admit). It is time for the fat man, Andy Reid, to go. "And let me take this opportunity to say that of all the innumerable print and broadcast journalists who have interviewed me in the U.S. and abroad since I arrived on the scene nearly 20 years ago, Katie Couric was definitively the stupidest. As a guest on NBC's "Today" show during my 1992 book tour, I was astounded by Couric's small, humorless, agenda-ridden mind, still registered in that pinched, tinny monotone that makes me rush across the room to change stations whenever her banal mini-editorials blare out at 5 p.m. on the CBS radio network. And of course I would never spoil my dinner by tuning into Couric's TV evening news show. That sallow, wizened, drum-tight, cosmetic mummification look is not an appetite enhancer outside of Manhattan or L.A. There's many a moose in Alaska with greater charm and pizazz." .....their two top coach coordinators had job interviews this past week?? Steve Spagnola, the Giant's defensive coordinator, and Kevin Gilbride, the offensive coordinator, each had a job interview this past week for a head coaching vacancy. The Jets interviewed Spagnola and the Raiders interviewed Gilbride. I don't care who you are, that has to affect your preparation in advance of a big game. Hey if it did, it helped my Eagles win. But when I am Emperor, those kinds of distractions will be outlawed. 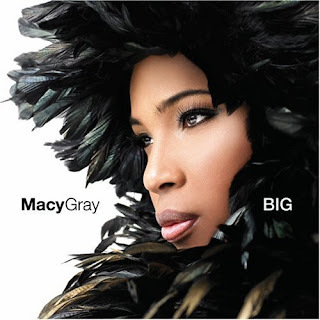 This girl Macy Gray can really sing. No big news of course since she has been a big star for a while. But now from this day forward she has my imprimatur and it is on the internets! This afternoon, I have been listening to her album all afternoon on my new Bose sound system. The album is called "On How Life Is". I highly recommend it. It will make you want to dance.